Request 1 or more color combo here. 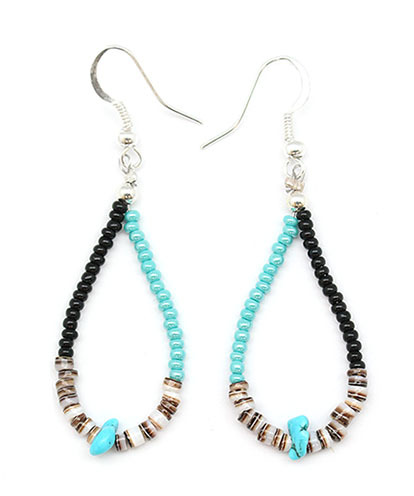 This beaded loop earring has half black beads and half lite blue beads with one chinese turquoise nugget with olive heishi. It measures approximately 2 1/4" long with silver-plated french wires. Native handcrafted by Navajo artist Sandra Francisco. Colors of nugget will vary. Only available in half lite blue and half maroon, half navy blue half maroon, half black half maroon or half navy blue half black seed beads. Choose color combo when ordering. None available like pictured.